In a recent article, we discussed five common mistakes you see people make at the gym when working out. Today I would like to offer you three more mistakes that people make and simple solutions on how you can avoid them. Mistake 1: Resting far more than you are working. I see this everyday at the gym: people who spend more time walking around getting “pumped up” or talking than they actually spend lifting and working out. I am not saying that you have to be lifting or working the entire time you are at the gym, but if you do a total of 6 reps in an hour period, do you really think you are maximizing your workout time? I understand that some workouts call for more and/or longer rest periods, but for the majority of the population your rest times should stay between 30-60 seconds. This will help keep workouts intense and allows you to get more done. Solution: Bump up the intensity on your workouts. Learn how to do that here and here. Or visit our workouts page for tons of intense workout options! Mistake 2: You never workout legs. 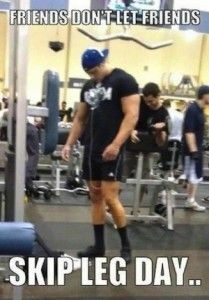 For whatever reason, legs are one of the most avoided workouts at gyms. We all love a great chest or bicep workout, but I cannot express enough the importance of legs. Legs are vital in not only building a solid base, but for your overall health and fitness. Leg workouts will help build tons of lean muscle, burn fat for hours after workouts, and benefit you in all areas of working out and life (making daily tasks easier and allowing you to lift more weight on upper body exercises. They are that powerful!). I know that working out legs is very hard, but the benefits you will see is worth the 30-45 minutes of pain (the good pain that is!). Solution: Start working your legs 1-2 times per week. Exercises such as squats, deadlifts, front squats, leg press, and lunges are a great place to start if you need ideas for exercises. Mistake 3: You do not push yourself to the brink at least once per week. I don’t understand the people who go to the gym and do the same, lazy routine week in and week out. They never step out of their comfort zone and truly push themselves. Some people you see at the gym hardly break a sweat while there. How is that possible?! I am not saying that all your workouts should be grueling or that they should punish your body, but your body can handle much more than you think. At least once per week, I make sure I go through a workout that leaves me on the floor begging for no more by the end. Typically these tend to be my leg days, but really any workout will do the trick when done right. A few other workouts that do this are all out sprints, a few of the circuits found here, and any workout that involves doing tons of burpees. If you are struggling to see results, I challenge you to question yourself and ask if you are truly going as hard as you can go in your workouts. If you think you are then great. If not, then it is time to bump up the intensity. Solution: If you are unsure, then go out to a track or field and do ten 70-80 yard full on, full speed sprints with only 45 seconds rest in between. At the end of that workout, you will know what it is like to truly push yourself. Don’t get caught being the sucker that walks around the gym for five minutes bobbing their head while listening to their music (which is on way too loud), then get under the squat rack, do a half rep, and repeat. You will see no results aside from getting lots of weird looks from other gym-goers. Instead, start training like you mean it, kick up the intensity, and simply go to work. You are at the gym to see results, so start training like it. P.S. Like this post? If so, hit that ‘Like’ button before you go! Thanks.